Tomatoville® Gardening Forums Index > Regional Group Tomato Tastings > MAGTAG™ XII - 2017 > It's August - let's get serious! ... well, as soon as our tomatoes ripen! So far, I've picked one Lemon Boy and a handful of Sungolds. Lots of greenies on the vines, though - I really think that because everything is so late, I'll have more 'maters than usual by the 20th. Forgot to mention - Once more, I will (wo)man the BLT Bar. Unfortunately (for us), my husband Dave Wright is supposed to meet Stan Lee at a comic convention that day, and he hopes to get him to sign his copy of Iron Man #1. So Dave will help set up, but will be unable to grill. I'm sure the Gregs and others will step in in his absence, though! 1. The Cherokee Purples are very prolific this year. I've harvested half a dozen awesome big ones, and lots more normal-sized. 2. Black Krims are phenomenally prolific. Good sized, and a very, very nice, dark taste. 3. Big Rainbow is just beginning to come in. Large but not huge (like I'd hoped). A couple have just ripened and are sitting on the sideboard. Stupice is pretty tasty, but it's hard to take seriously; they're so small. Still, they're busting out all over. Golden Jubilee is also a serious producer -- a real trouper, and beautiful. I give most of them away as they're rather mild. I have some red varieties, but they're not very exciting compared to the purple and black, IMO. Plus, as I mentioned in a previous post, I don't know which are which, since they got mixed up. Well, that's not quite true anymore -- I've identified most of them. They're not producing a lot; maybe they can tell they're not Mommy's favorite. There's one plant with cascades of medium-sized fruit, as yet unripe. It's quite picturesque, just like a photo on a seed packet. I will bring 'em all on the 20th. 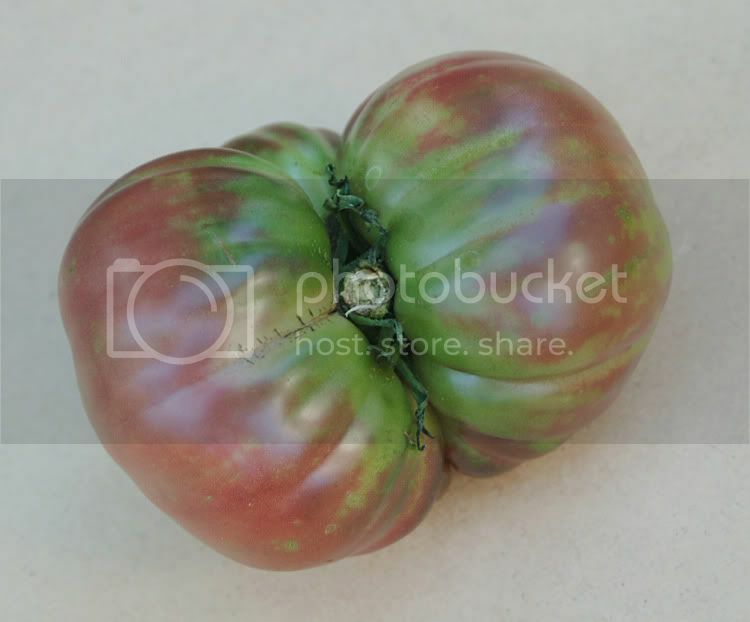 Black Krim is now on my list for next year. Thanks for the news, Christine. Well it has not been a good year for tomatoes in SE PA. Great year for peppers though, my pepper plants are falling over under the weight of 10+ peppers per plant. Anyway I have high hopes for a new yellow I grew this year, Hugh's. I have some really big ones that will be ripe soon. Omar's isn't producing the super giant fruits it did last year but I will have plenty of Omar's Lebanese as well. Black Cherry I really like, hope it is still producing in a few weeks. See y'all on the 20th. I picked my first Cherokee Purple last week - it was twisted around the wires of the cage and I had to break the fruit to harvest it. So of course, I had to eat it right away. Yum! Lots of sungolds, and most of the other plants have green fruits that should be able for MAGTAG. As usual, if anybody has some extra 'maters that they can donate to the BLT Bar, I'd appreciate it. It certainly IS a beauty!